The iPad Pro 12.9 case is made from beautiful PU leather. Open it and your iPad Pro wakes up. Close it and it goes to sleep. It also provides the convenience of storage for Apple Pencil. Available in a variety of colors for your option. IPad Pro 12.9 case with pencil holder supports stylus horizontal and vertical stand, which is corresponding to video and hand-writing mode. In addition, the two holes behind the holder allow you to push your pencil out conveniently. 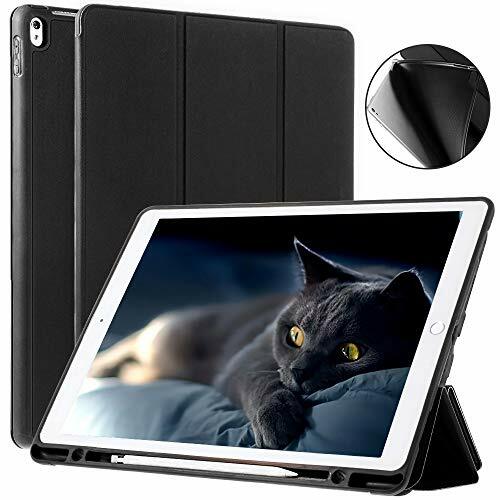 The tri-fold front cover can support iPad in two standing positions, the 65°angle is for FaceTime, reading or film-watching, and the 30°angle is for typing, drawing or programming. Fabric cover with built-in magnetic closure supports auto sleep/wake function, which helps to save on power and battery life. 0.1s closing to sleep and opening to wake up effectively extend 30% standby time while protecting your 12.9 inch iPad Pro. The iPad Pro smart cover protects the back as well as the screen, while maintaining the thinner and lighter design of iPad Pro. How to check the setting of ipad pro 12.9 case when the auto sleep/wake function can not work? Please open setting, select "Display & Brightness", and then find the "Auto-Lock" to open "Lock/Unlock". No, there are precise cutouts designed for every botton and ports, including camera. Thus you don't need to remove the ipad pro case when taking photos.